Sunday, March 2nd, 2008 : Sunny and pleasant, Water Temperature 46* and clear. Laid around the house this morning watching fishing shows till 9 0'clock wishing I was out on the water because there finally was No Wind! I knew 2 friends were out on the lake fishing this morning because both of them invited me to go last night so I called one of them up and he said fishing was slow. I waited about 10 minutes and called the other guy up and he also confirmed the fishing wasn't much but I just could not take it anymore, the outside temperature has risen from 20* up to 30* and I told him to pick me up on the dock at 10 am. We hit a flat with some boards and worked it for 300 yards and didn't get a strike so we decided to get on the big motor and look for some deep fish since the shallow bite was off. I kept seeing balls of Herring right on the channel edges and a couple of fish nearby and no fish anywhere else so we decided to set up over 30 feet of water working nearby the channel. We just set out 4 downlines to "feel" the water out and the front right rod bent over and popped right back up. I told Anthony to check it, it just got hit. He thought it hit bottom but reeled it in and put it right back out. The whole time I was watching this take place on the depthfinder and when he engaged the reel after putting it back out it bowed over again . The fish waited for him to put the bait back out, we watched the fish hit the bait and him fight the fish on the Lowrance. 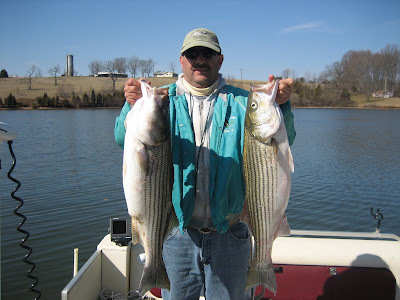 We set out a couple more rods and duplicated the same scenario time and time again watching the Stripers come off the bottom and take our offerings. I came off the water at 1 o'clock , boating some nice 10 pounders and satisfying my urge to get out of the house. Anthony is holding a couple of the fish we caught , we did not have a stringer to show the other fish.